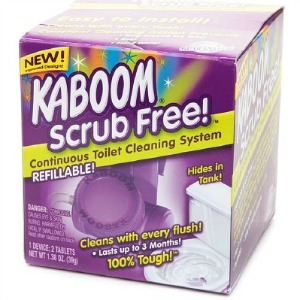 I bought a spray can of Kaboom toilet bowl cleaner Foamtastic, since I was intrigued with a product you spray into your toilet, instead of the more traditional squeeze bottles. First, let's start with the claims this product makes. It says it has "the power of Oxiclean stain fighters," so I am assuming it uses oxygen bleach as at least one of the cleaning agents for the product. What it does, just like the normal Kaboom Foamtastic cleaner is sprays on blue and then turns white when it is supposed to be ready for scrubbing. I was apprehensive that I would get this spray everywhere when trying to spray it in the toilet, such as on the seat or get overspray everywhere, but that really wasn't as big of a deal as I feared. In fact, it was quite nice for coating the entire bowl, including under the rim. I think that more products should be made a spray for the toilet based on the ease of use I had with this product. Unfortunately, the cleaner didn't actually work very well. Yes, the product sprays on VERY blue. It was rather alarming how blue it was actually, but almost immediately it began turning white. I didn't actually time it, but I would say that it turned completely white within about two minutes, and you could watch it turn progressively whiter and whiter. whether it was really ready for me to scrub with a toilet brush, but I figured I would try it. I really think it should have sat longer before I tried to clean the toilet, but it really didn't do much. I think most of the cleaning power came from me scrubbing, not from the cleaner. I have a bit of a toilet ring on that particular toilet and it did absolutely nothing to remove it. I will need to use another product, and let it soak longer, to see if I can get rid of the ring later. Plus, as I sprayed it I was overwhelmed by the smell of the product, which was VERY strong, especially since it was in aerosol form. I had to turn on the exhaust fan to remove it from the bathroom. Overall, I would not recommend this product. It has a great delivery system, but the actual cleaning power of this toilet cleaner is not very good. If you have I'd love to hear your opinion of them, whether you agree with my assessment or not. You can share your review here of a toilet cleaner, of any type or brand, or read lots of other reviews that have already been submitted. Join in and write your own page! It's easy to do. How? Simply click here to return to toilet cleaner. Let me start off by saying, I am an older, single woman. No one else lives here. That being said, the Foamtastic cleaner you reviewed above is okay, but not great. I do, however, LOVE the tablets that clean a bit with every flush. In my community our water is so hard that we get that scaly ring around the waterline AND down the side of the bowl where the water comes in. The tablets don't dissolve the ring/trail, but they do keep the bacteria from building up and turning them black, so they are barely visible. I have tried pretty much everything in the marketplace and all the home remedies. So far, I haven't found anything that will remove those chemicals. Thanks so much for your review of the automatic toilet bowl cleaner version of this product. As with many of them it is said to be a bleach based cleaning product. I am not sure how the addition of Oxiclean in that instance does much good, since oxygen bleach and chlorine bleach negate each other's effectiveness. I am glad you like it though. I was obviously unimpressed with the Foamtastic spray on version. Has anyone else used the scrub free toilet cleaning system? If so, I'd love to hear your thoughts on the product. 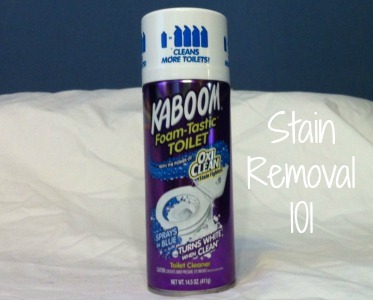 You can share your review here or read lots of other product reviews for cleaning your toilet.